The world's most comprehensive study of geothermal springs has provided unique insight into their make-up, discovering 28,000 different microorganisms. University of Canterbury microbiologist Dr Matthew Stott takes a sample at the Champagne Pool in the Waiotapu geothermal area of the North Island of New Zealand. 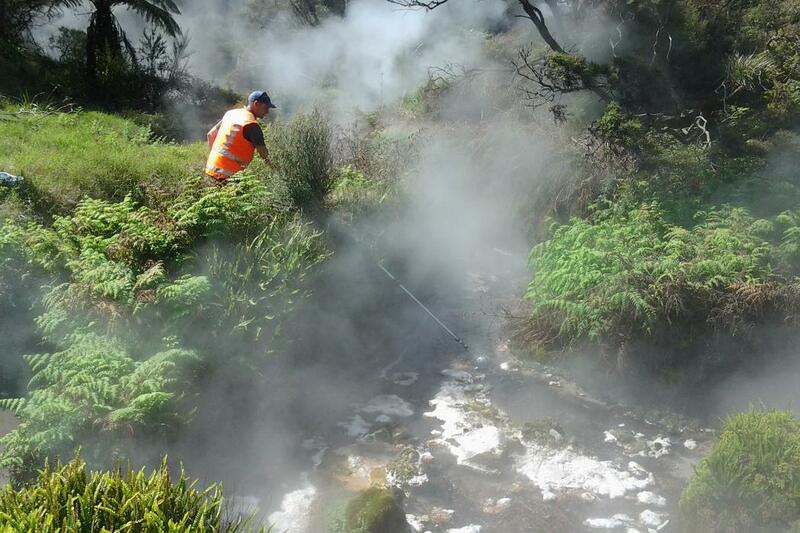 Over two years, researchers have systematically sampled hot pools in the Taupō Volcanic Zone, the geothermally abundant region spanning 8,000 square kilometres in New Zealand’s North Island. The geochemical survey project was co-led by University of Canterbury microbiologist Dr Matthew Stott and Professor Craig Cary, of the University of Waikato. The MBIE-funded $1 million 1000 Springs project has had its first major results published in the high profile journal Nature Communications. The team looked at the biogeography of the bacteria and archaea in the pools, what is driving their distribution, and the importance of the springs’ chemistry and physical conditions. The pools range in temperature from 18°C to 100°C. Samples from each pool have been through DNA extraction, with researchers finding more than 28,000 different strains of microorganisms. Formerly of GNS Science, Dr Matthew Stott now works in the University of Canterbury’s College of Science and as co-Principal Investigator of the project is enthusiastic about the project outcomes. The comprehensive analysis of 1000 geothermal pools is a project on a scale never approached before. The researchers used comparable methodology and along with that consistency there was also a wide geographic and geochemical spread. It is an amazing diversity of geothermal ‘extremophilic’ bacteria, according to the researchers. And that is just at genus level, with species and strain still to be explored. “From a scientific perspective the geothermal pools are a huge untapped and undescribed resource. There is also a history of economic value in the geothermal world, so it’s true to say we have not known the value of what we have,” Professor Cary says. The research group began with simple questions, such as why is one pool just metres away from another so different, and who is there? The 1000 Springs Project is the largest and most comprehensive landscape scale geothermal study ever undertaken, and its value is still to be fully tapped. The next step may be analysis down to the genome level, where the true uniqueness of the microorganisms lie. It is not just the magnitude of the study that is distinctive, but also the nature of the scientific partnership with local iwi. Much of the Taupō Volcanic Zone (TVZ) is within the rohe of different Māori groups. Kaitiakitanga and mātauranga (indigenous rights and knowledge) were very much at the forefront of the team’s minds and work practices, Dr Stott says. “We could never have done this without the iwi guidance and permission. We were allowed to sample a large number of springs throughout the TVZ, many of which were important in terms of tribal knowledge. It was a great learning experience for both researchers and iwi; the researchers learnt about traditional uses and korero of different springs and the researchers were able to provide insight into the microbial world and how the chemistry and microbiology interact in hotspring ecosystems,” Dr Stott says. Much of the data generated from the 1000 Springs Project is viewable on the project’s webportal (http://1000Springs.org.nz) where users can explore images, chemistry and the microbial diversity of springs from this study.